This 1943 US Office of War Information short movie was partially filmed at Camp Croft. You can download the 13 min MPEG version here and play it using Quicktime or visit the Internet Archives website for other download and viewing options. 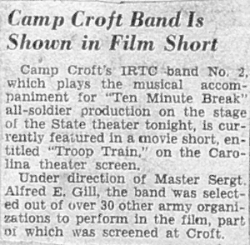 The Croft sections begins at 4:40 min when band music, by the 2nd IRTC Band at the camp, is heard. There is a brief look at the camp area in the background and a nice shot of men from Company B 40th ITB marching by the camera. The link below will take you to a short video on YouTube which was likely shot by Louis Davenport, of Midvale (now known as Wanaque) in Passaic County, NJ. Thomas C Davenport (1919-1999), believed to be a son of Louis, was drafted into service in Feb 1941 and sent to Camp Croft for training. Little is known of Thomas's army experiences. The beginning scene of mountains was likely shot en-route between NJ and SC. The next few scenes show Camp Croft as it appeared in 1941, beginning with a retreat formation on the parade field. In the later shots, note the lack of grass, no sidewalks, and plenty of Upstate SC red mud! Camp scenes are interspersed with shots of downtown Spartanburg. Thanks to Dustin Partridge and Derek Billingsley at Image East Video! The link below will take you to another video on YouTube which was owned by Frank Earl Rodriquez, soldier station at Croft. Earl, or "Rod" as he was sometimes known, served in the Pacific Theater and returned home. At about 20 seconds into the film, Earl is seen on the right of the viewer with another soldier as they come down the stairs of a building. At about one minute there is a stable with a sign “Saddle Horses for Hire” which is believed to be the riding stable operated at the army camp. At about one minute and 35 seconds, there is the Elite restaurant ("Where the Elite Meet to Eat") and Kress in downtown Spartanburg. This is followed by aerial shots of Spartanburg and the area around the downtown airport. At 7 minutes, 25 seconds there is a shot of the Carolina movie theatre. And lastly, at about eight minutes and 25 seconds into the film there are scenes of Lake Lure, NC. Earl's nephew recalls his uncle telling him that once when he had leave, he thumbed a ride from the camp to Lake Lure, and these images are from that experience. Thanks to Gordon Wilson (and Earl) for sharing! From South Carolina ETV's "Road Show", a short video about Camp Croft, a WWII Army Infantry Replacement Center located near Spartanburg, SC. Soldiers were trained at Croft from 1940 to 1946. The site now memorializes those soldiers.